As a Listen Technologies dealer, we might be a little biased but with 20 years of experience, we have used, tested, owned and handled numerous portable interpretation transmitters from several manufacturers. This, in our opinion, makes us the perfect candidate to review the Listen Technologies Tour Guide system. Language interpretation actually uses these units on a regular basis. 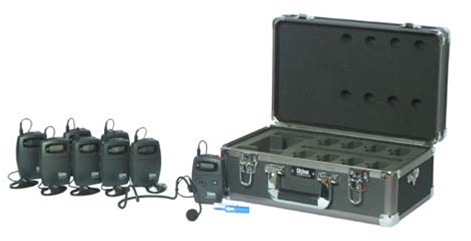 Atlas Language Services, Inc. uses these as both our in-house interpretation equipment in addition to the rental of these units. As a dealer of Listen Tech equipment; we thought we would provide our feedback and findings for our readers. Before we get into specifics lets cover the frequency differences first. While both frequencies work great with the Listen Tech systems, our preference as a Language Service Provider (LSP) is the 72 MHz range. Both the 72 and 216 MHz portable transmitters such as the LT-700 offer up to 150’ of transmission range based on line of sight (LOS) and personally, I have heard the LT-700 broadcast in excess of 150’ but it does tend to pick up static once you exceed that 150’ LOS. However, that is not a statistic that is supported by Listen Tech that we know of. Nonetheless, the 72 MHz is our frequency of choice for one simple reason. The 72 MHz frequency can support up to six (6) transmitters broadcasting simultaneously whereas the 216 MHz frequency can only support up to three (3). For exhibition tours that require us to support six (6) tours going on simultaneously, the 72 MHz is our only choice! Every even-numbered year, we provide simultaneous interpretation and language support services to a large international company. During that event, we also provide six of the LT-0700-072 transmitters and about 200 of the LR-400-072 receivers. We prefer the LR-400-072 receivers during these exhibit floor tours. Since we have so many tours going on simultaneously, we need to control the frequencies. So the 72 MHz is numero uno in our book. Now don’t get me wrong the 216 MHz frequency works very well when less than three transmitters are needed, however, if there is ever the chance of needing more than three transmitters/tours going on at once then why not allow yourself the option of supporting multiple tours simultaneously. When it comes to portable transmitters, the Listen Tech LT-700 is one of my favorite portable transmitters. There are other manufacturers who sell portable transmitters as well such as: Williams-Sound T36 and the Gentner Venture-Express which are both good solid units. That said, the Williams-Sound T36 is a solid choice and would be my second pick next to the LT-700 and the Gentner Venture –Express coming in third. The Gentner is a solid durable unit as well, however, it is only offered in the 216 MHz range which to me is a shame. The Williams-Sound T36 is a little lighter in weight than the LT-700 and can theoretically broadcast up to eight units simultaneously in the 72 – 76 MHz range, however, from my experience it is a little difficult to quickly change channels and mute. So, what separates the LT-700 transmitter, that is the user’s ease of use. The LT-700 has a nice big red mute switch with flashing light. It is an easy to read LCD display, exceptional battery life and can bounce well when dropped. Although, I don’t advise doing so! It is a very user-friendly unit that is very dependable. Being able to quickly locate the channel of the tour and/or change channels really make the receiver a critical unit during a tour or interpretation. When it comes to ease of use for attendees, we find that the Listen Tech LR-400 or LR-500 are great options. Depending upon the usage. The LR-400 has the channel section buttons hidden behind the cover, which is both good and bad in the sense that the attendee will not be able to change the channel but during interpretation, it is ideal to keep the attendee from channel hopping. The Listen Tech LR-500 has the channel section accessible on the face of the receiver. For tour groups transitioning from one room to another and having to change channels in order to hear various tours. Personally, we like the Listen receivers. They have proven to be very durable, simple to use and easy on battery consumption. The Williams-Sound R37 is a very close second. It is just as durable and easy to use as the Listen LR-400/LR-500 receivers but is not as cosmetically attractive in my opinion nor as easy to use. I know that is a stretch, and honestly, if that is the only thing that separates the Williams-Sound R37 receiver from the Listen Tech LR-400/LR-500 then that speaks for itself. I am not a huge fan of rechargeable batteries in any of the receivers nor the transmitters. I haven’t had good luck on a long-term basis with rechargeable batteries and as an LSP that rents the equipment. The last thing we need is a couple hundred people rushing to the headset distribution center saying their unit is dead and having to change out batteries on the spot. That said, I prefer to use Energizer Industrial AA batteries. We replace the batteries after every event, regardless of the amount of time used. Although this is an added cost, it does eliminate the crowds from rushing the headset distribution counter. As well as unhappy users who lose time listening to the tour or event. The amount of time the disposable batteries last is about 15 hours give or take. Let’s face it, a case is pretty much a case… but I do like the Listen Cases. They are custom cut to accommodate the unique shape of the Listen receivers. The downfall is that the Listen cases ( LA-320, LA-311, LA-321, LA-324) do have the outer shell. This shell tends to scratch pretty easily. However, when it comes to durability the case does what it is made to do, protect your equipment. The Williams-Sound cases tend to have the same issues, easy to scratch, dent, etc. but durable. The outside might show signs of wear, but once again your equipment inside will be protected. Overall the Listen Technologies tour guide system is a great choice for tour groups or event language interpretation. Depending upon the number of receivers you need, the system is easy to adapt and upgrade. The transmitters and receivers can take a beating. And we have had some in our inventory with hundreds of hours of usage that are still going strong. Since Atlas Language Services, Inc. is an authorized dealer of Listen Technologies, please feel free to contact our sales team for very competitive prices. You will never pay MSRP when you purchase Listen translation equipment from Atlas Language Services, Inc.
Atlas Language Services, Inc. is an A+ rated business by the Better Business Bureau as well as a corporate member of American Translators Association; Association of Language Companies; Crystal Lake Chamber of Commerce; Chicagoland Chamber of Commerce; Midwest Association of Translators & Interpreters; Meeting Planners International; and the Illinois Paralegal Association.